Once or twice a week, I get a huge bounty of fresh produce. My Farmhouse box arrives every other Wednesday, and I shop my local farmers market on Saturdays. Over the years I’ve learned a few strategies for cleaning, storing and using fruits and vegetables to make sure everything lasts throughout the week. I absolutely hate throwing food away. I know you do too, so I’m hoping you find this little guide helpful to avoid food-waste for yourself. We’ve partnered with McCormick to share these tips as well as a few easy ideas to whip up farm-fresh dishes using their Gourmet dried herbs & spices. 1. 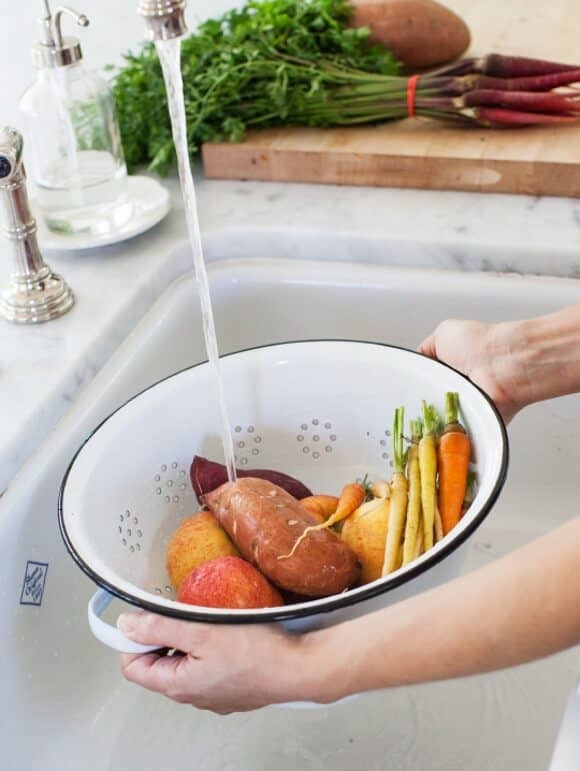 Wash fresh fruits and vegetables (except mushrooms) in cold running water. Clean mushrooms with a damp cloth to gently remove the dirt. 2. I like to wash leafy greens in a large bowl so any dirt can fall to the bottom. 3. Dry salad leaves in a spinner or just lay them on a towel for 20 or so minutes. 4. Scrub root veggies (sweet potatoes, carrots, etc.) with a brush to remove dirt. Or just rinse & peel, but I like to preserve the nutrients by leaving skins on. 5. Except for leafy salad greens, fruits and vegetables should be washed just before you’re ready to use it, (i.e. not days in advance). 1. Certain vegetables (and fruits) contain a gas called ethylene. Ethylene triggers the ripening process and will deteriorate some veggies faster. My #1 storage tip is to make sure you store ethylene-producing vegetables separate from ethylene-sensitive vegetables. ethylene-producing produce: apricots, avocados, bananas, cantaloupe, melons, mango, peaches, pears, tomatoes. ethylene-sensitive produce: apples, asparagus, broccoli, carrots, cucumbers, eggplants, green beans, leafy greens, potatoes, summer squash. 2. Store veggies un-cut to last the longest. Cut produce should be tightly covered and used within 1-2 days. 3. Below are a few storage suggestions. This is just a rule of thumb – your vegetables may last longer or shorter depending on when (and where) they were picked and when you took them home. Salads with chili-lime dressing: whisk olive oil, lime, honey, and chili powder. Sliced veggie plates with hummus: blend chickpeas with olive oil, lemon, garlic, salt, pepper, cumin & coriander. Simple pasta: lightly sauté summer squash with basil, oregano & parmesan. Mediterranean: add crushed red pepper, bay leaves, oregano & a can of tomatoes. (Click for the full recipe). Mexican/southwestern: add coriander, chili powder, cumin & black beans for a soup that’s similar to this vegetarian chili. 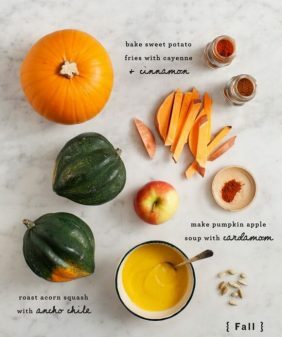 Indian: add madras curry, turmeric, cayenne & a can of coconut milk for a creamy curried soup similar to this one. This post is sponsored by McCormick. All thoughts, words and images are my own. Thank you for supporting the sponsors that support Love and Lemons. This post is definitely getting bookmarked. Despite dealing with some of the same veggies every season, I still find myself asking google “how to store…” before I put my veggies away. Thank you for the great reference page! Oh man, I definitely need to print this. So useful! Thanks for the tips! Some of my fruits and veggies have been known to go bad before I can use them. I’m working on doing more kitchen and cooking tips on my blog, so it’s inspiring to see how helpful it is to others. I hate throwing out food but do it far too much so these tips are great! Until recently I’d been putting my tomatoes in the fridge – they really do taste so much better when you leave them out on the counter. Thanks for the great tips! I really avoid to throw out food, so I use up as much as possible – even if the veggies don’t look so nice any more. Wrinkled bell peppers and tomatoes are just fine in a ratatouille or a veggie-lasagna. Wow I was doing so much wrong, so helpful. Thank you for posting this! Love the pictures! You make everything look so yummmmmmmyyyy!!! awesome post! I gotta stop storing my tomatoes in the fridge! what is the reason for that? Does it affect the flavor? Because I think they do last longer in the fridge. yep – they lose their flavor and become bland really quickly. 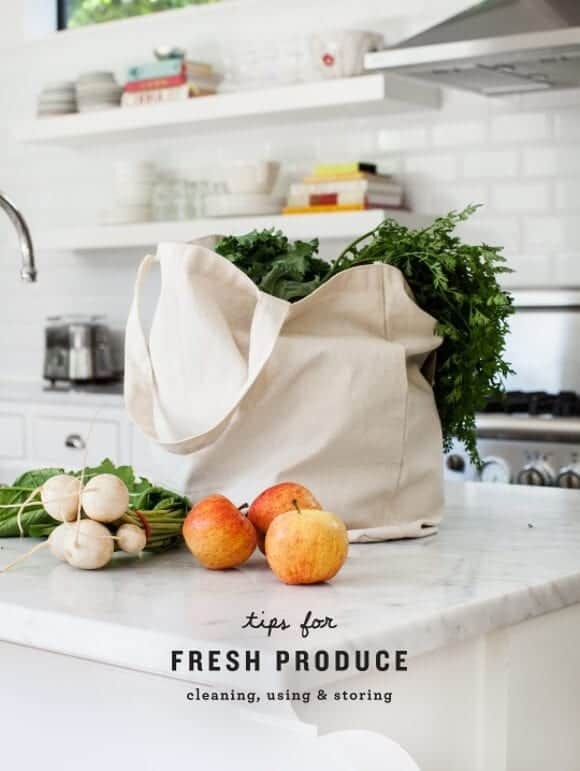 I <3 <3 <3 all the tips & tricks here cause I have always had problems with too much veggies I usually buy at Farmers Market. Thank youuuuu. I got hungry because of your photos! Fantastic website. Lots of helpful information here! Thank you! <3 I'm coming back soon! Thank you so much for this post. So helpful. Wondering if you could also tell us where you got the big canvas bag? Looks like a great bag to use at the market! Thanks Jeanine. It does look like a great bag! 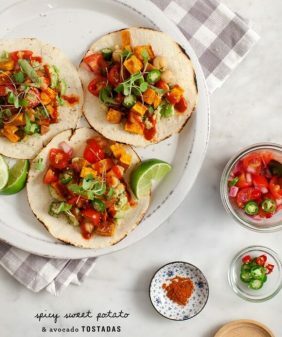 Keep up the wonderful posts and recipes. Thanks for this super-detailed and clear post! You’ve actually told me something new about which veggies shouldn’t be stored together, and now my apples are resting comfortably in the fridge. Thanks! OMG this is the best. Thank you! So helpful. Thanks so much for the guides and recipe ideas. I just found your blog and love it. This is SUCH a useful reference—not to mention I now will save money by not throwing away produce gone bad quickly (thanks, especially, to the ethylene tip). Thanks for the great information. Great tips, Jeanine! Jealous of your highly organized spice drawer….mine is in shambles right now! Excellent – love how you broke out how to “use up” – though, you might consider that we don’t all have tons of veggies left each week. An easy way to handle this, is to chop up/throw veggies into a big freezer bag and keep it in the freezer. Once it is full, you have the base for either a terrific veggie broth for cooking , or a soup. Hi Ariel – you’re absolutely right – I actually do that too. I use the leftover (collected) frozen veggies in frittatas and leftover frozen greens for pesto. Love the photos and the soup spice mix is great! Thank you so much for all these useful tips! Love this little cheat sheet! So smart to plan to use your fragile veggies first too, how have I never thought of that? We freeze all sorts of fruits and veggies and throw the frozen fruit in overnight oats and smoothies and the veggies into eggs and fritatas on the weekends. I’m always glad we saved them that weekend when I enjoy my eggs! Im not sure why these showed up so many times. Sorry about that! no worries! Hope you enjoy the soups! The “green bags” by Debbie really do work for keeping veggies fresh longer. I also learned a trick recently for celery which is to wrap it in aluminum foil before you put it in the fridge. It really works! I was so tired of throwing out celery all the time. I put my kale in a plastic grocery bag and spritz it down with water, then just tie the bag shut. My kale stays good for up to, and sometimes past, a week. I learned it off some you tube video on raw food. Works great!!!! Your diagrams are great! I’m going to print, frame and hang them on my kitchen wall! So interesting article! I eat a lot of vegetables just because I have a garden at the back of my yard. I love the part with the cleaning because sometimes we forget how important is to clean the production properly. Thanks a lot! Charlton Carpet Cleaners Ltd. This site is fantastic. Thanks for all the tips and the great vibe i got from your fine pictures. I’ve never had enough vegetables that I needed to store them, but I’m really trying to work on my food storage these days. That little earth quake in California a few weeks ago made me think about my emergency preparedness. I’d like to eventually have a good-sized food storage in its own room. Such a useful article! This year I’ve decided to freeze some of my home-grown fresh vegetables instead of buying cans or already freezed from the store, so this post will come in handy. Thanks for sharing! This is amazing! never knew about this before.